I wrote our last post from our flight to the Atlanta airport on our way to Thomas' family in Florida. Although we've been back for a while, this is our first chance to tell you all about our fun trip! Thomas' good friend Seth drove us to the airport. We were blessed with good weather for our flight southeast. We did get to see some pretty cloud formations, like this one, but we experienced no turbulence and had enough time to catch our connecting flight at the Atlanta airport. We were pleasantly surprised to meet Thomas' dad Jeff on our flight to Pensacola -- he was traveling for work and was able to return earlier than originally planned, even getting a seat last minute on our plane. On Tuesday morning, we had the privilege of joining Thomas' parents when their home teachers came by. They were kind Southern gentlemen and we appreciated the opportunity to meet them. On Tuesday afternoon, Thomas and I went out together. We drove through the neighborhood where he used to live, and even got to see the house he lived in (which sustained a lot of damage during Hurricane Ivan in 2004). We went to the beach and ate a picnic lunch. It was my first time seeing the Gulf of Mexico, and my first time on a warm beach! We ate on the steps of the unoccupied lifeguard tower. Thomas was good at spotting these little bitty sand crabs! We saw literally dozens of Portuguese Man-o-Wars along the beach. We learned that they are not actually Jellyfish, but each is actually (strangely enough) a colony of four different but dependent organisms. A sting from one of these suckers has the potential to be deadly. On Wednesday, Thomas' brother Robert and his family arrived early in the morning. In flying from Seattle, their flight was delayed and they missed their connecting flight. Rather than wait to fly in the morning, they decided to rent a car and drive through the night from Atlanta to the Bradshaw home. We are so glad they made it safely. 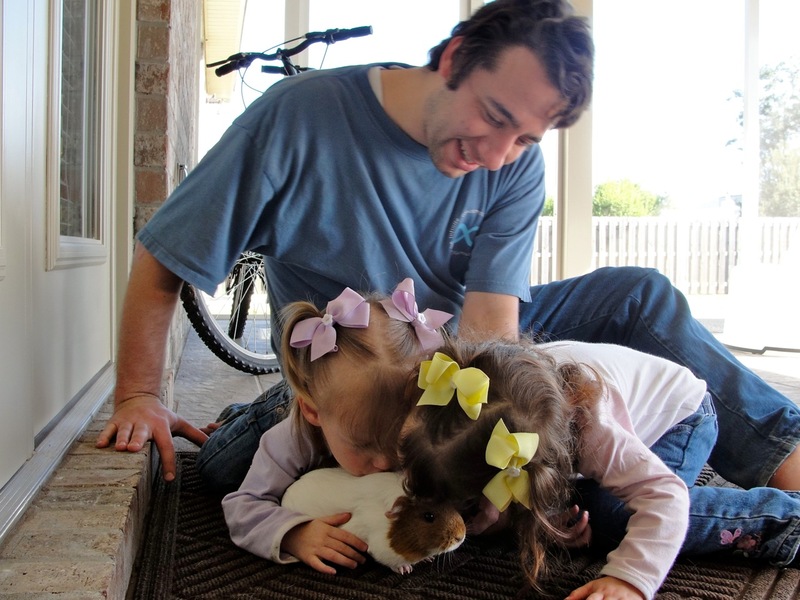 We enjoyed playing with Robert & Camille's adorable little girls. Everyone pitched in to help cook and decorate throughout the day. Robert with the girls giving some love to Temperance the Guinea pig! Thursday, of course, was Thanksgiving! 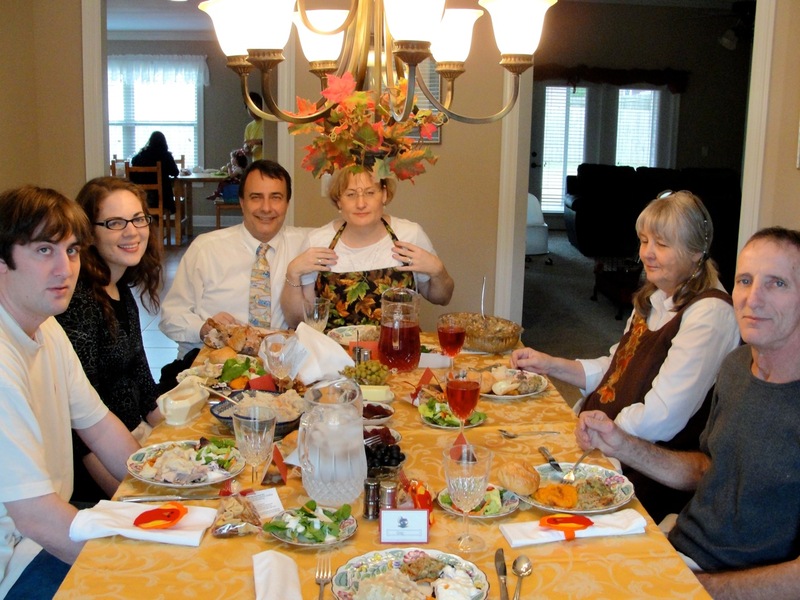 We had two tables to accommodate the 14 total eaters, and lots and lots of yummy food. I count it a success! Place settings. Cute napkin rings, eh? After our feast, we had a celebration of Thomas' birthday (which is tomorrow). His mom made his traditional birthday cookie tree. 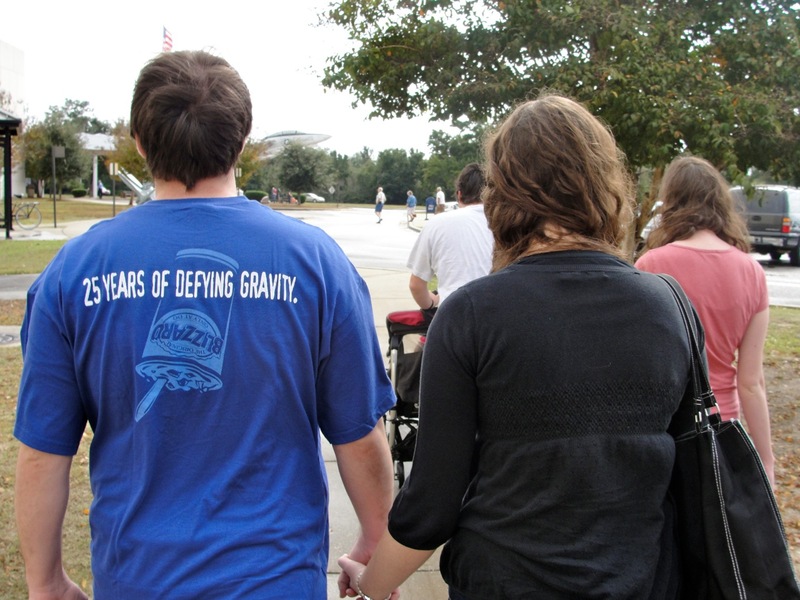 A DQ t-shirt: "25 years of defying gravity"
2 crêpe pans from France! Look at that smile. This is the finished cookie tree! Complete with "snow." 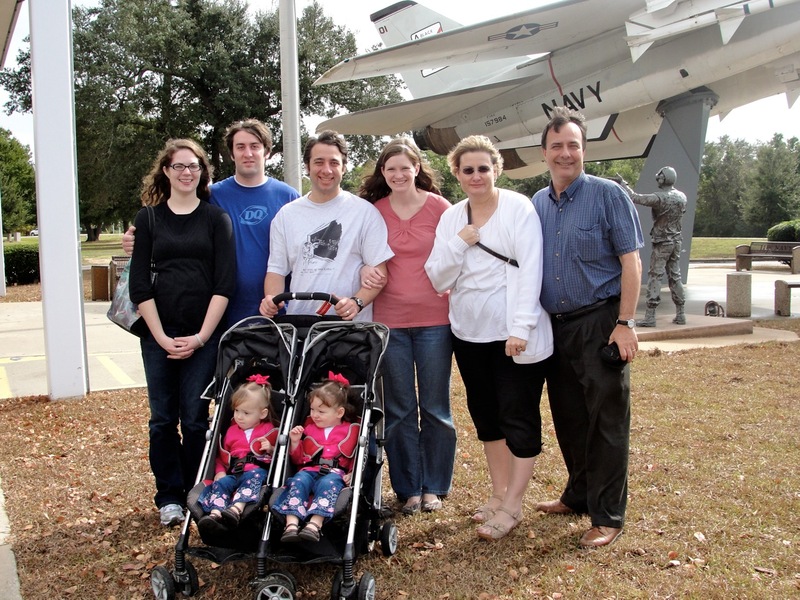 On Friday before we flew back to Utah, we went to the National Naval Aviation Museum in Pensacola. Ruby & Lydia had a great time at the museum! Our return flight was a little bumpier than the first one, but we made it safely back and so did our luggage. 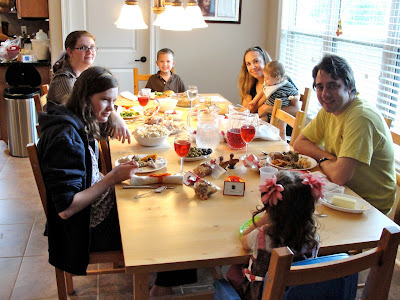 We had a great time and we were so glad to be able to spend our holiday with family. And even though Florida isn't Thomas' favorite place, my skin sure loved the humid climate! Feeling homesick....glad you two are coming out soon... aren't the beaches amazing! West coast beaches are beautiful, but I just can't enjoy them the same after warm beaches... man o war-didn't realize they were there, scary! Glad you guys all had fun-that's a great smile Thomas!!! !